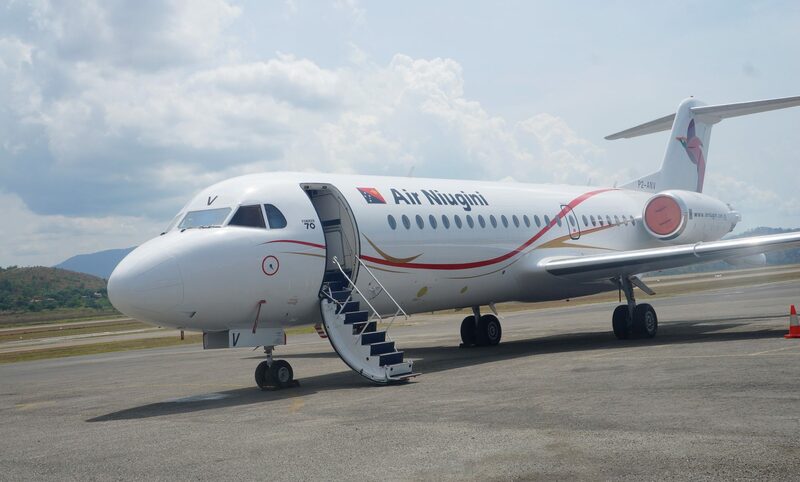 Air Niugini ‘s latest acquisition, a fifth Fokker 70 aircraft arrived in Port Moresby Port Moresby over the weekend (Saturday 12th November). The aircraft is currently awaiting completion of regulatory approvals and paperwork from CASA PNG prior to commencing operations. Air Niugini is expecting another four F70 aircraft during 2017, to take the total up to nine aircraft. Air Niugini Chief Executive Officer Mr Simon Foo, in welcoming the additional F70, said this latest arrival is a continuation of Air Niugini’s re-fleeting exercise to replace the Q400 aircraft and standardize its domestic and short haul regional international operations on an all Fokker 100/70 jet fleet. He said the F70 aircraft has significant advantages over propeller driven aircraft in terms of speed, range, and passenger comfort, and best meets the airline’s needs into the future. The Fokker 70 is a longer range aircraft than the Fokker 100, Q400 and ATR , which is of significant benefit to Air Niugini and its customers as the airline continues to expand its services across the country and the region. “This longer range means an F70 doesn’t have to stop to refuel as it has sufficient fuel capacity to fly further without refueling stops.” Mr Foo said. The F70 aircraft service both Air Niugini’s domestic and international destinations. The addition of this latest aircraft will allow the airline to reintroduce services on the sectors between Lae, Hoskins, and Rabaul, reintroduce jet services to Hoskins later this month as soon as the runway upgrade is complete, as well as adding services on other routes to cater for the peak Christmas period. Air Niugini currently has a total 25 aircraft including B767, B737, F100, F70, Q400 and Dash 8. The Dash 8s are operated by its subsidiary company, Link PNG. Meanwhile Air Niugini operated a special flight from Brisbane, Australia to Gurney International airport in Alotau earlier this month. Most passengers onboard the special flight were tourists who attended the annual canoe festival in Alotau.